Growing up in 19th-century Sicily, rebellious Angela (Valeria Solarino) finds herself attracted to her best friend Sara (Isabella Ragonese). As deep friendship turns to passion, Angela's strict father demands that the relationship cease and that she marry. Refusing, Angela is locked away until her resourceful mother comes up with a solution that enables her to live with her lover, and seemingly satisfy convention. Based on a true story, this beautiful and seductive film dramatically portrays a historical case of gender-bending. Starring two of Italy's best known young actresses, and ex-Bond girl and Il Postino star, Maria Grazia Cucinotta who also produced the film, Sea Purple has drawn comparisons to The Secret Diaries of Miss Anne Lister in its depiction of a landmark lesbian story. Director Donatella Maiorca states: "The film is not only about sexuality, it is about freedom and women's identity." Sea Purple's soundtrack is by legendary Italian singer Gianni Nannini and veteran Brit arranger Wil Malone, who has worked with Oasis, The Verve amongst others. 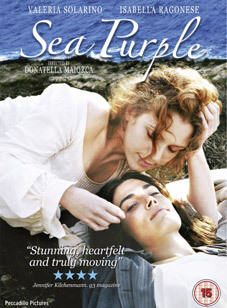 Sea Purple will be released on UK DVD on 20th June 2011 by Peccadillo Pictures at the RRP of £15.99.